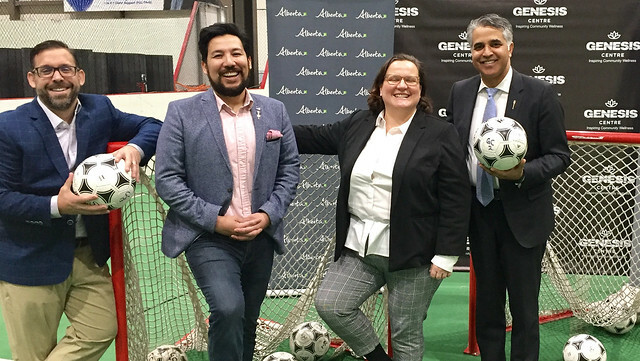 Minister Miranda announces funding to upgrade the outdoor soccer field at Calgary's Genesis Centre. Government is investing $2 million to help the centre install artificial turf and upgrade lighting, scoreboards, walking paths, portable bleachers and leisure areas. The current pitch is a natural field that is expensive to maintain due to extensive use. Up to 10,000 community members use the field annually. The new artificial turf will reduce operating costs and improve the field for players. It will also add much-needed space, as the growing community has the highest minor soccer enrolment in the Calgary region. The project is estimated to cost nearly $6 million. The City of Calgary has committed $2 million, and the North East Centre of Community Society, which operates the Genesis Centre, is contributing nearly $2 million. The project is scheduled for completion in 2020. The Genesis Centre is a multi-purpose complex in northeast Calgary. In addition to offering sport and recreation amenities, the venue acts as a cultural, social and educational community hub. More than 1.6 million people have used the centre since it opened in 2012.